The pans are dishwasher safe, but do not use steel wool, steel scouring pads, harsh detergents, bleach, or abrasive cleaners. The quartz particles enhance the browning process resist stains and can be heated to 500 degrees F.
Staub is an investment that is meant to last for many years to come with proper care. Staub's Shallow Cocotte Dutch Oven is the perfect height for stew. The shallow walls create a high moisture cooking environment. This facilitates the cheaper cuts of meat to be tender and moist. The enamel coating is resistant to rust, chips, and cracks. No seasoning is required! The heavier weight allows the pan to hold heat keeping your meal warm while serving. 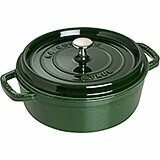 The quartz particles enhance the browning process resist stains and can be heated to 500° F. The Cocotte Dutch Oven can be used on all cooktops including induction. 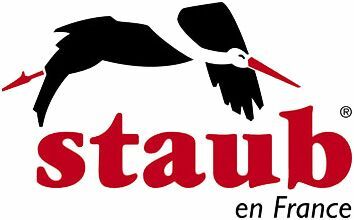 Staub is an investment that is meant to last for many years to come with proper care. When using your Staub cookware bring your pan slowly to a high temperature, use plastic, wood or nylon utensils only (metal utensils may damage the enamel), do not bang against hard surfaces, allow pan to cool before washing, and completely dry pan before storing. The pans are dishwasher safe, but do not use steel wool, steel scouring pads, harsh detergents, bleach, or abrasive cleaners. Size:13" X 11.8" X 5"